Surprisingly, I wanted to watch Sisterakas because I wanted to, not because I was forced to or dragged to by a well-meaning but terribly misinformed friend. Frankly, I wanted to see it out of morbid fascination. I knew it was going to one of those movies, the ones that would capitalize on the stars involved and slapstick humor, which I do not find funny. Sisterakas is one of the contenders for this year’s Metro Manila Film Festival, and in the recent awards night, won Best Supporting Actress for Wilma Doesnt and 3rd Best Picture. The story revolves around the rivalry between Bernice (Vice Ganda) and Detty (Ai-Ai Delas Alas), which began in childhood when Detty’s mom discovers that her husband is sleeping with Bernice’s mom, the maid. Bernice rises to become owner of a successful line of apparel called Ponytale and Detty falls on harder times. She unwittingly applies as Bernice’s executive assistant and goes through grueling tasks under the terror boss, who knows her identity and is planning his revenge. Then there is Roselle Hermoso (Kris Aquino), who runs La Yondelle, Ponytale’s fiercest competitor. 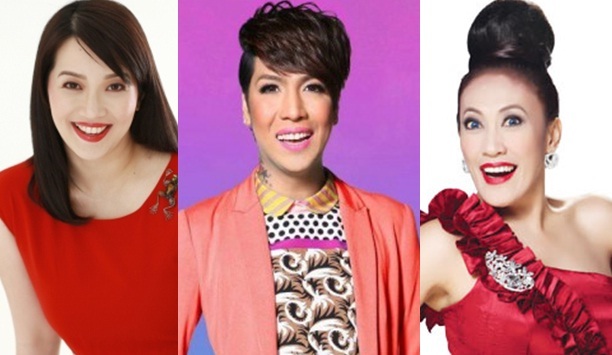 Sisterakas heavily relies on the fame and style of its leads: Vice Ganda, Ai Ai Delas Alas, and Kris Aquino. There is Kris’s over-the-top kolehiyala aura, Ai-Ai’s self-deprecating facial expressions (and those tired jokes about her chin), and Vice’s trademark sarcasm. It was funny in Praybeyt Benjamin, but he pushed it in This Guy’s In Love With U, Mare! and it got really stale. The movie had its moments. While everyone was guffawing over Vice’s retorts, I found Kris to be the real star. To me, she carried the entire film as Roselle, the raving lunatic. She was believable and I think the realism lies in the role being a parody of the real Kris, making it easier for her to act. I see her more effective in comedy than in horror, where she looks so… controlled. And then there are her costumes, and the references to her personal life. This movie wouldn’t be possible without Kris as a large chunk of its appeal is the satire on Kris’s filmography and marriage to James Yap. Case in point, Bernice’s assistant James, who responds with “Yup?” when called and Roselle’s first line: That was worse than a Kris Aquino horror movie experience. In spite of Kris’s endearing acting, it does not save the movie. Overall, Sisterakas feels half-finished, rushed. Character development is scarce, and the only one I saw was for Vice, who as a child felt obligated to be more bongga because of what happened to his mother. There is no clear explanation as to why Ai-Ai ended up becoming poor. In fact, the only explanation was that she separated from her husband. Kris’s character appears out of nowhere and serves only to upstage Ponytale. Perhaps the clearest example of the rushed quality of the film is the Daniel Padilla-Kathryn Bernardo love tandem. One minute they get introduced to each other, there are at least two instances of Daniel wooing Kathryn, then Daniel saves her from a requisite accident. We assume that she falls for him because she smiles when he cracks another one of his tired pick-up lines, then in the next scene, they’re breaking up. And oh, during the final scenes, you can see Daniel laughing at what was otherwise a “dramatic” scene. The movie had its shining moments, but those moments are isolated and are usually on the lines delivered, not on the story itself. In short, the scenes worked around the humor, instead of the other way around. Sisterakas isn’t exactly on a purist’s priorities to watch, but it’s the kind of movie that doesn’t require you to analyze or ponder on anything. It’s a shallow watch but it’s worth seeing for Kris.